There have been many arguments about who is the ‘best’ Sherlock Holmes on film or television, and I have mentioned a few of my favourites on this blog. What of Dr Watson? Here’s my starter for ten, those gentlemen (and lady) who have most memorably played the good doctor. The first time I saw this Zeffirelli version of the famous Bronte classic, I wasn’t particularly impressed with either Charlotte Gainsbourg’s feisty interpretation of Jane, or with William Hurt’s over-sensitive version of Rochester. This Jane is the one with dark and brooding tendencies (played as a child by Anna Paquin, this side of her comes across well); while Rochester is damaged by his past but not quite right in the characterisation, less a gothic hero than a damp squib. A second viewing put both in a more favourable light, but the problem is that ‘Jane Eyre’ has many other, much better, adaptations out there and this version adds very little. In the cast we have Billie Whitelaw as a creepy Grace Poole, the reliable Joan Plowright as Mrs Fairfax, Samuel West as the colourless St John Rivers, and Maria ‘Last Tango’ Schneider as the imprisoned lunatic, Bertha. One or two scenes stay in the memory – Josephine Serre as the very French Adele; Jane’s sketching; the wedding sequences; Jane and Rochester’s first meeting (but this scene has been done much better before) – but as a whole it is pretty throwaway and forgettable. A radical shake-up of the plot shows Jane’s flight from Thornfield before anything else, before returning to her childhood story. Australian actress Mia Wasikowska, previously known for the lead in Alice in Wonderland, is a very different Jane to those we have seen before. She is so quiet and delicate the wind could blow her away. My only gripe would be that her accent wanders and can’t quite decide where to stick. German-Irish actor Michael Fassbinder is a traditional looking Mr Rochester, but his first interview with Jane is disappointingly truncated. Having said this, the 2011 version is excellent and the changing around of plot points to make the adaptation more cinematic gives this version some bite. I know that Fassbender has made his name since this as an actor who generally plays complex low-lifes or undesirables, but in this he is everything a Rochester should be. Good support, too, from Jamie Bell (little Billy Elliot, as St John Rivers! ), Sally Hawkins (as nasty Aunt Reed), and Freya Parks (as tragic Helen Burns). Orson Welles, for me, is the definitive Rochester, handsome, egotistical, unpredictable. He’s also more subtle and touching than other actors who have played the role. A real weepie, despite the weak central performance of Joan Fontaine as Jane. Watch out for a very young Liz Taylor as Helen Burns. One of my all-time favourite period dramas, even if all the mists and stuff are more of Emily Bronte’s country than sister Charlotte’s! This version suffers from its continued unavailability in a decent print or DVD release. A great shame, as the music (by John Williams) is lovely, there are beautiful landscapes and scenery, and George C Scott is wonderful as Rochester. His heartbreak as he doesn’t understand how Jane can leave him after the aborted wedding is very powerful. Susannah York is a beautiful and passionate Jane, although she doesn’t have the youth the part requires. Also in the cast, and doing well, are Ian Bannen (Rivers), Jack Hawkins (Brocklehurst, dubbed but still memorable), Jean Marsh (an affecting cameo as Bertha, trapped in her own little world). This may be viewed as a second-string film for Scott, but it did get theatrical release in the UK and, despite the poor quality prints we see now, did have a decent budget. I like it a lot. This creaky Monogram cheapo, running at just over an hour, manages to change the Bronte novel to such a degree that after the first ten minutes I had to stop laughing, forget about the book, and enjoy the film for what it is – essentially a film using characters from ‘Jane Eyre’. Jane Eyre is a wilful child who is happy to go to Lowood and eventually is fired after calling her employer a ‘wicked old crocodile’. So the whole point of abuse of Lowood is lost with this flippant treatment and the complete removal of Helen Burns. Oh, and Jane swans off with ‘the inheritance she has from her uncle’. Eh? On her way to Thornfield with a comedy cart driver (added character, husband of Grace Poole) she steps down and gets in the way of Mr Rochester’s horse. OK, this is from the book, but her response to his questioning what she does at Thornfield is not! Once at the house, Adele is the English niece of ‘Uncle Edward’, so removing the point of illegitimacy and neglect of the child, who is now doted on. Even the first scene of conversation between Jane and Rochester is off-kilter, especially when she takes to the piano and sings to him! Blanche Ingram is a matronly woman who couldn’t possibly compare with Jane’s ringlets; Adele does imitations of party guests for Blanche’s dad; and there is no Mason, no gypsy scene, no tension. There is the burning bed scene but that falls flat and has none of the drive we expect to see from that situation. Rochester is waiting for an annulment to come through, so no obstacle to marrying Jane and no potential bigamy here. In fact Adele suggests he marries Jane and so he rushes to propose! The ‘mad’ wife seem strangely lucid, although Jane still leaves when she sees her and almost immediately it seems the house burns down. John Rivers is included briefly as Jane goes to work for his mission and even agrees to marry him before meeting Mr Poole again and discovering about the Thornfield fire. Now her affections seem to change again and she goes back for the reconciliation with the now blind Rochester. As Jane, Virginia Bruce is far too pretty but she was a good actress and, putting aside the book and other interpretations, is watchable and engaging. Colin Clive, best known for Frankenstein, plays Rochester with some skill but does not have enough to work with. This version is too merry, too happy, without the complications and the discontent you would expect to see from a man disappointed with his lot and damaged from an inappropriate marriage to a madwoman. I was glad to see it and have rated it fairly high because as a film on its own, it is quite good. As an adaptation of Charlotte Bronte’s complex novel it is a disgrace. 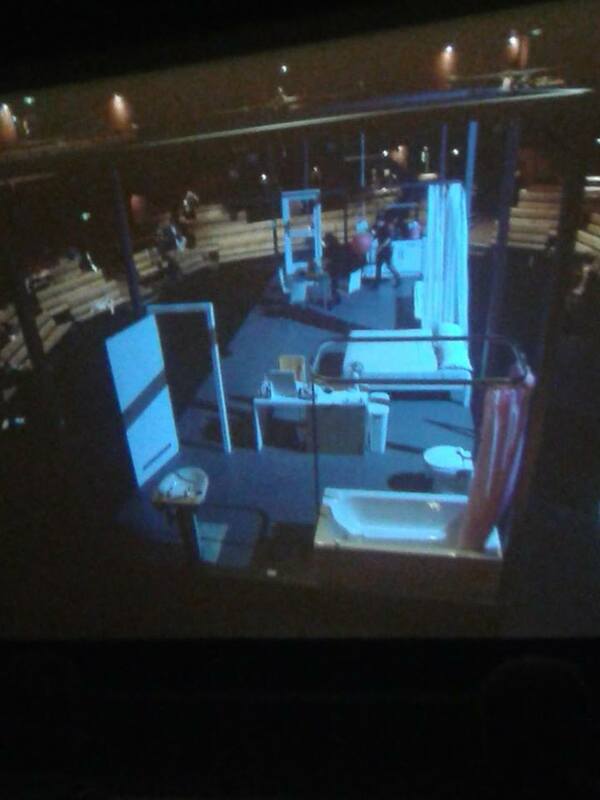 From the screen of the Curzon Richmond, I watched the Encore performance of ‘A Streetcar Named Desire’, recorded live at the Young Vic. As this space can be configured in any way to suit the production, designers and directors always have a free hand, and here Magda Willi’s revolving set allows the audience to eavesdrop on the action within the Kowalskis’ home, a minimalist, clinical pot where poker, Chinese lanterns, and the kindness of strangers mix into the plot. Benedict Andrews directs this production, and updates the costumes and music to give an additional kick to the potency of Tennessee Williams’ play. So you will hear Chris Isaak’s ‘Wicked Game’ and PJ Harvey’s ‘To Bring You My Love’ (also used in the series 2 opener of Peaky Blinders), alongside Patsy Cline’s ‘Stop The World’ and an original score by Alex Baranowski. Although some reviews have stated this is a minus, as Stanley, Stella and Blanche can only exist in the past, I think it balances out the plot well and makes key scenes in the action more relevant and accessible. Gillian Anderson’s Blanche Dubois makes her entrance dragging a large pull-along suitcase and wearing shades, tottering into an area she clearly despises, having come from better things. She is a surprise guest at the home of her sister Stella Kowalski (Vanessa Kirby) and Stella’s husband, the brutish Stanley (Ben Foster). Theirs is a passionate relationship fuelled by violence and desire, and Blanche is walking straight into hell. Corey Johnson as Mitch is a strong supporting character, who you may remember was essayed brilliantly by Karl Malden in the old film. He’s the sympathetic one at the card table, the one with the sick mother, the one who sees a beauty and innocence in Blanche which hides any doubt about her age or past. In one knowing scene which could not have been used in 1951, Mitch and Blanche discuss her marriage and issues around her husband’s ‘degenerate’ nature and eventual suicide. In parallel scenes in each half of the production Mitch hangs up a pink lantern for Blanche, and then rips it down when he discovers her true nature. The film’s use of close ups occasionally jars when aspects of the revolving set get in the way, but they are used to great effect in places, especially involving Anderson’s transformation from the cool and calm schoolteacher to the lipstick-smudged doll on the edge of insanity. It’s a towering performance which will infuriate, amuse and eventually break your heart. Her interplay with Foster’s Stanley is also very good, and he does not over-dominate proceedings – you know he is there, and you know there is danger when he is about, but he is also content to take second place to Miss Dubois. Stella is a more problematic character, who seems turned on by domestic violence and who eventually abandons her sister and her principles for the man who has caused everything to collapse, but in Kirby’s portrayal she is very well-rounded and you can see her struggles and her love for her family conflict with her animal passion for her husband. It’s difficult to fault this performance in any way, and this NT Live production is definitely well worth watching. Following on from the recent O2 stage shows, the Monty Python team have been much on my mind, and I wanted to bring some of my favourite sketches of theirs to your attention. I don’t expect everyone to agree with me, but here are my picks. No ranking (that’s FAR too hard), but these are the moments I would not want to see wiped from the archives. Sharing links only to spread the joy, copyrights remain with the creators, etc, etc. You can buy the series episodes, the films, and the German specials on DVD, as well as the other programmes referenced here. There doesn’t seem to be much love for the Spielberg movie of this play (which uses real horses) but in the case of this theatre production I have to say that Handspring and their horse puppets deserve all the plaudits that have been given to them. In rural Devon, 1912, young Albert acquires Joey the foal thanks to his drunken dad’s attempt to outshine his brother. During the process of caring for the horse a bond develops between boy and animal that even their parting by the Great War can’t break. The use of minimal sets and staging (a torn piece of paper for projections, lights, music and of course the puppets – including a comic goose for light relief) all contribute to the sense that we are seeing the world through the eyes of a real animal in real locations. The battle scenes are superb in their depth, Albert grows from a naive farm boy to a lance corporal who has seen the horrors of war, and if the good German is a little shaky in accent, then it just adds to the balance given here between friend and foe, as experienced by the horse. This play feels cinematic even though it is sparsely staged, and some moments are emotionally draining, especially the scene in No Man’s Land. Most of this is due to the skill of the puppeteers who make the objects real. Cinema – several screenings at the BFI Southbank which I will be talking about; in the next week alone there are screenings of a ‘Wuthering Heights’ from the 1960s and a ‘Jane Eyre’ from the 1950s, and a Sweeney special. In February there is a rare big screen outing for the 1970s classic ‘The Godfather’, a TV double of ‘Miss Julie’ (featuring a favourite of this blog, Ian Hendry) and ‘Let’s Murder Vivaldi’ (with Glenda Jackson), and a screening under the Passport to Cinema banner of ‘Black Narcissus’. Theatre and concerts – the National Theatre’s production of ‘King Lear’ with Simon Russell Beale opens this month, and Heaven 17 play in Birmingham on Valentine’s Day. Christy Moore and Joan Baez both play at the Royal Festival Hall this year. Television – ‘Mr Selfridge’ is returning for a second series, ‘The Musketeers’ return in yet another version for the BBC, a biopic about the life of Ian Fleming is showing on Sky Atlantic, ‘Father Brown’ is back in the daytime, and I’ll be looking at series 1 of ‘House of Cards’ as the second series airs on Netflix. Books – a new occasional series of posts will look at some of the books in my collection, starting with Carl Rollyson’s ‘Hollywood Enigma’ about Dana Andrews, which was first mentioned on here in my post about the film ‘Laura’. Review projects – I will continue to dip in and out of reviews of the archive television productions aired as part of ‘Masterpiece Theatre’, ‘Play for Today’, and ‘Armchair Theatre’. Tribute profiles – for his centenary, the next profile will look at 1940s film favourite John Hodiak. 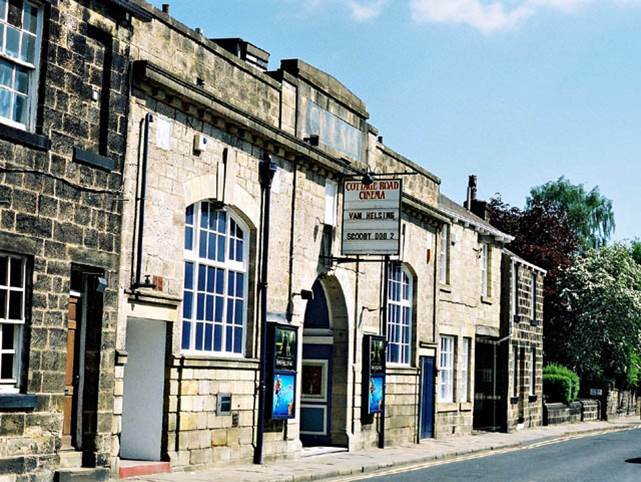 The Warner Village multiplex in Kirkstall at Cardigan Fields (now Vue as of 2006, with 9 screens) opened in 1998. It was a little bit soulless but had projections in the foyer of the likes of Bugs Bunny at the time of opening. 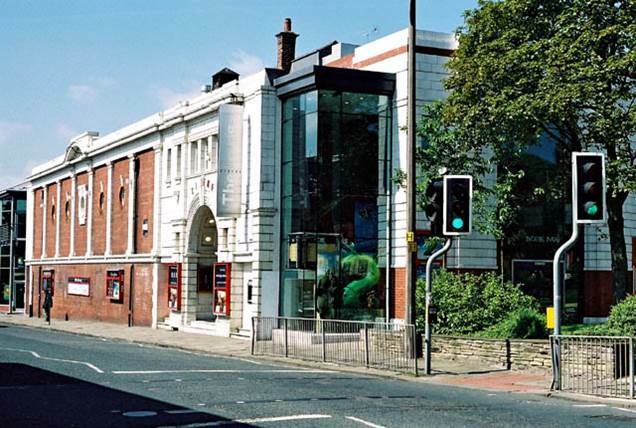 The 13-screen Ster Century cinema in Leeds Town Centre opened in 2002, and became part of the Vue group in 2005. This effectively killed the Odeon Headrow (which is now a branch of Primark). The ABC (which was a little cinema with a lovely atmosphere and by far my favourite of the city centre options), closed in February 2000. It had been open since 1934 (originally called The Ritz). It has since been demolished. The Odeon (opened as the Paramount in 1932) closed in October 2001. 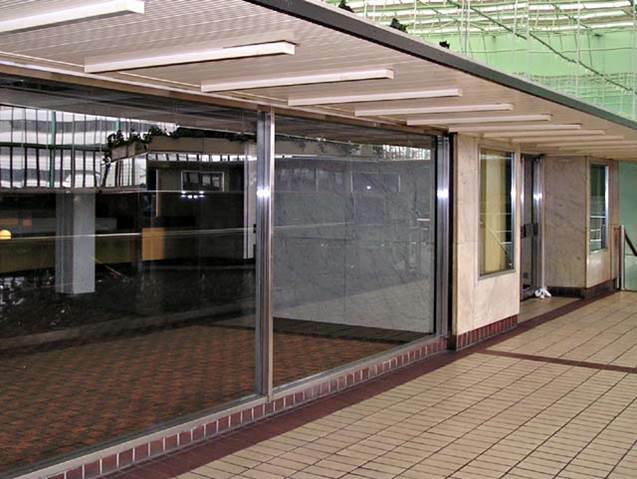 There is also a ‘ghost Odeon’ in the Merrion Centre, which was open from 1964-1977, closing after the Odeon Headrow became a twin cinema and just as it was about to become a triple screen. This area on the 1st floor of the centre has not been used since. 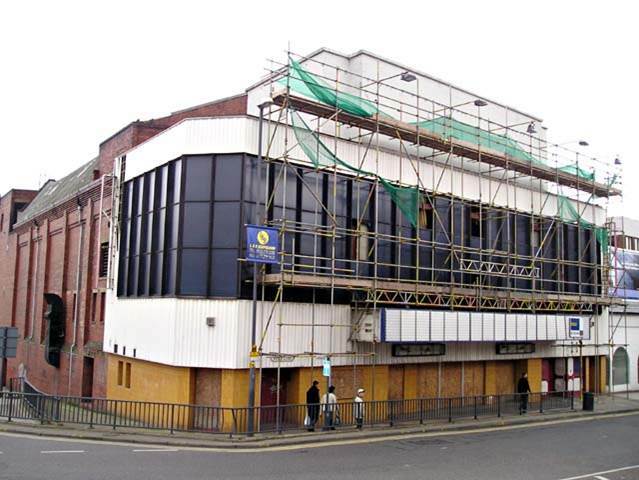 The Lounge, which had lost much of its audience when the Cardigan Fields cinema opened, closed without any warning in January 2005. 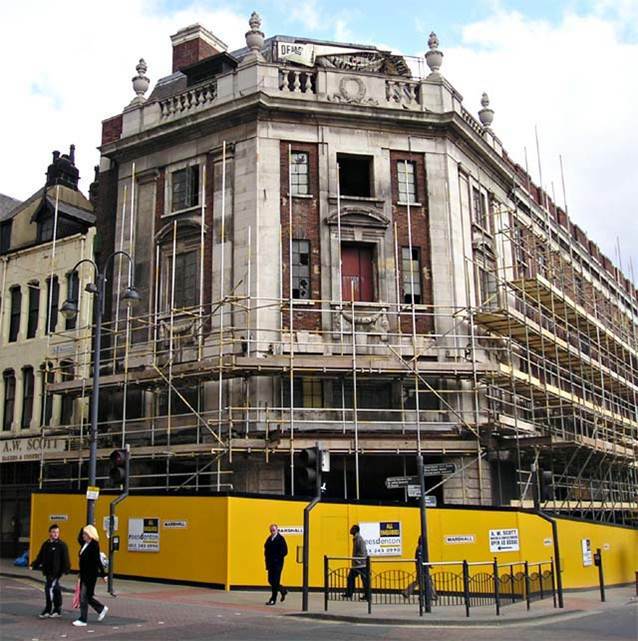 It had now been demolished apart from the façade, which is due to be incorporated into any future development. A pity, as this was a place I spent many happy hours when I lived in Headingley and visited the cinema every week. The Cottage Road (opened 1912) remains open. In July 2005 Cottage Road was taken over in a last-minute deal by Charles Morris, after the staff had been issued with redundancy notices. 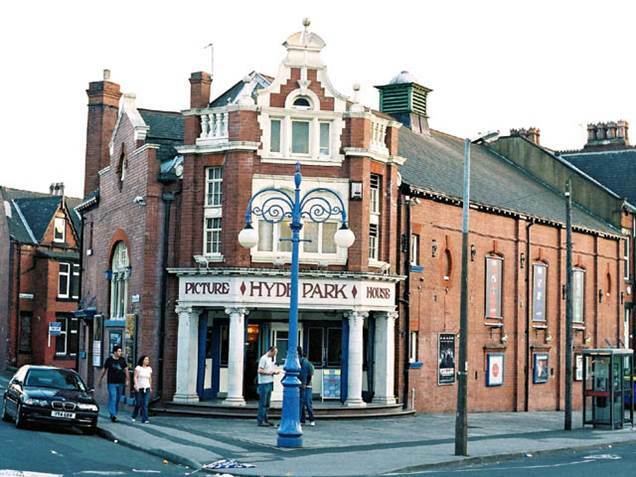 The Hyde Park Picture House (opened 1914) remain open in 2013. My grateful thanks to Vad Falcone, who took the photos in 2002. They were used for my live poetry performance of ‘Lost Cinemas’ which played at the Sheffield Showroom and Bradford’s Theatre in the Mill in 2005.